The famous "Lucy" specimen (Australopithecus afarensis) is one of the earliest known human ancestors to have had a comfortably humanlike upright stride. Her kind lived some 3.6 million to 2.9 million years ago. About a million years before her was "Ardi" (Ardipithecus ramidus), which had much more primitive feet, suggesting that although she might have been able to walk upright, she still was well adapted to life in the trees. So it came as quite a surprise last year when researchers described part of a fossil foot from 3.4 million years ago—close to Lucy’s age—that resembled the apelike foot of the much older Ardi. 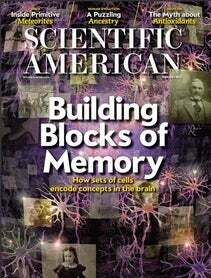 I report on the latest thinking about what Ardi, the mysterious new fossil foot and other finds mean for understanding human origins in the February issue of Scientific American. In the video below Yohannes Haile-Selassie, of the Cleveland Museum of Natural History, who led the project and research effort to describe the new find, explains why the primitive foot was such a shock.